It is not an eccentric rock star of the 18th century. 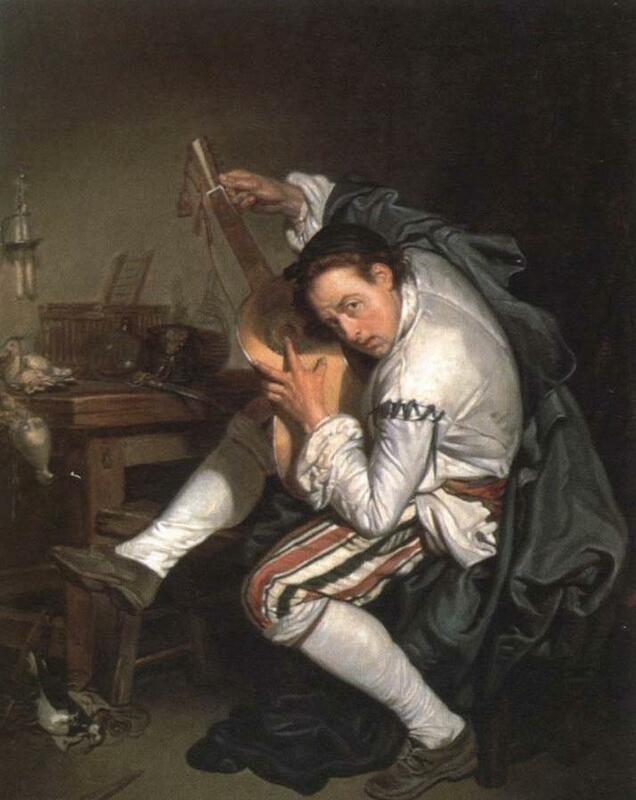 It is The guitar player by Greuze. The artist was the typical representative of French rococo. Although in most of his paintings, he was loyal to the movement and portraits characters from the upper class enjoying their spare times, Greuze is now recognized for his honesty and for being less pompous than his pairs. In the case of The guitar player, we see the character disturbed and focused in his musical instrument. Although many think that the musician is playing the guitar, he is actually tuning it; as one of his hands is adjusting the tuning peg. This is why he adopts that weird posture, bringing closer his right ear to the guitar, to listen carefully the tones of the strings. This work also has very curious characteristics. To begin, the musical instrument is not actually a guitar, because it has a very short fret board. While tuning a guitar is easy, other strings (many times, with paired-up strings), are more complicated. Probably, this difficulty is the cause of the upset look of the character. Is we look the work closer, we will notice another issue, even more curious: the hand that is adjusting the tuning peg is inside the sleeve of the guitar player’s coat, while the other is free. This detail makes us understand that the character is in a hurry and, thus, the work appears to be spontaneous. 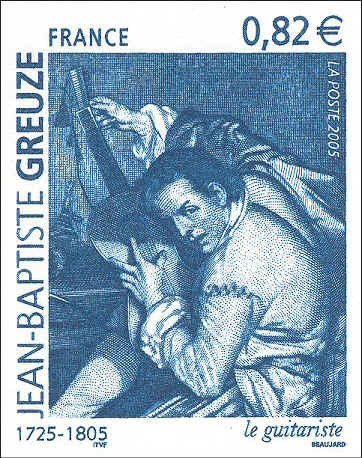 In 2005, with the 200th anniversary of the artist’s death, the French post issued a stamp celebrating Greuze’s guitar player. ~ by Álvaro Mazzino on March 2, 2011. The French brand plans an event like Gwyneth Paltrow plans a gluten-free, meat-free, nightshade-free menu: with precision and brand-awareness the likes of which most companies can only imagine. This entry was posted on March 2, 2011 at 15:47 and is filed under Rococo.You can follow any responses to this entry through the RSS 2.0 feed.You can leave a response, or trackback from your own site.